Sanders Fine Chocolate Milk Chocolate Dip Cups, 24 ct.
Sanders Fine Chocolatiers is a well known Detroit icon. 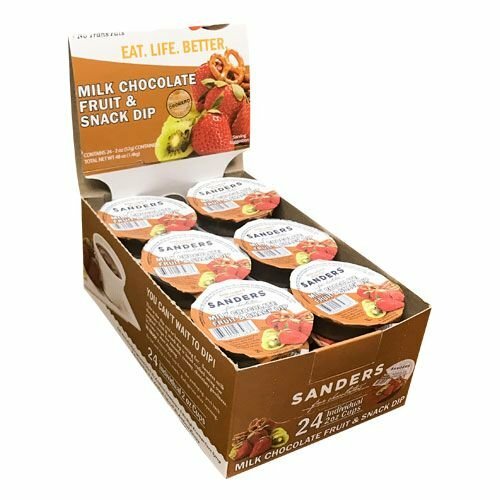 Sanders Milk Chocolate Fruit and Snack Dip is gluten-free and contains no artificial colors, no partially hydrogenated oils, no artificial sweeteners, no trans fat, no high fructose corn syrup, and no artificial flavors. Sanders Milk Chocolate Fruit and Snack Dip is creamy with the perfect texture for dipping your favorite fruit or snack. Sanders Milk Chocolate Fruit and Snack Dip is kettle cooked to the perfect taste. To get your taste buds salivating you can dip fruits such as crisp tart apple wedges, pineapple spears or chunks, whole strawberries or cherries, sliced kiwi, banana slices, pear wedges, cantaloupe chunks, whole seedless grapes, whole raspberries, and orange segments. Dessert ideas include dipping cake cubes (pound cake or angel food cake), brownies, rice crispy treats, cookies (biscotti, shortbread), graham crackers, mini cupcakes, marshmallows, mini cream-puffs or ice cream balls. If you are a vegetable dipper, carrots or celery sticks and red or green pepper strips work well. For a sweet and salty taste, dip pretzels, potato chips or potato sticks, popcorn nuts, crackers, and bread sticks. The plastic Tubs are disposable/recyclable making for easy clean up. Refrigerate after opening. 24 individual 2 oz. cups in a value-packed displayer case so everyone can add flavor to their favorite treats. A great snack after games and practice! Sanders milk chocolate is handcrafted using their original century old recipe bringing smooth, creamy, chocolaty goodness to so many snacking options. If you have any questions about this product by Sanders Fine Chocolates, contact us by completing and submitting the form below. If you are looking for a specif part number, please include it with your message.